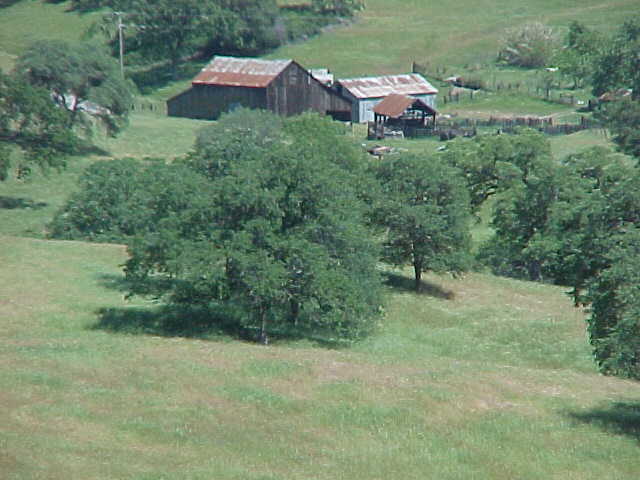 The old hamlet with this illustrious name in the rolling hills, pines and oaks on the old Raymond-Mariposa Road has been gone for these many years, but the historic old ranch bearing the same name goes on as if forever. And God, it is an old place, old, old. old everywhere one looks- the original plank house on the sprawling 2,000 acre ranch that goes back to the 1850s still stands, as does an old barn with the harness and horse collars hung upon the pegs where the hostler put them when he unharnessed the last team many years ago; the old hand bellows on the forge; the antique wagon wheel wright machine on the wall of the stable; and fixtures and fittings and tools marking each of the decades that followed. The kitchen in the main ranch house is still heated by a wood stove on which the coffee pot perks. the fireplace still heats the living room; and throughout the house are furnishing and paintings that came around the Horn from new York City before the first shots of the Civil War sounded. THE RANCH was founded probably in the early 1850's. by a Dr. Harris about whom little is known. What he was a doctor of is not clear, but when he sold the ranch to Morgan W. Quick for $250 in 1859, he signed the deed with a laborious x mark. Quick came to California around the Horn from New York State in 1849 to stake a gold claim near Mariposa, making some $10,000 a year from the diggings. Over the years the ranch prospered and passed from one Quick generations to the next. Today it is owned by the fourth and fifth generations, Clyde E. Quick, former Chowchilla educator who lives part time on the ranch, and Gary E. Quick of Fresno. There is a sixth generation coming along, Gregory E., Gary's son. THE ORIGINAL Quick left a great heritage -substantial ranch buildings which have weathered these more than 100 years; the pioneering of barbed wire and gasoline-powered farm trucks and equipment; the techniques of growing new crops in the foothills; the developing of a unique gravity flow ranch water system from the many live springs, all of which are still being used; and the instituting of ranching techniques that are still practiced. But his great monument is the wall of rock that fences in 640 acres of the ranch, gently pushing up grassy hillocks, dropping into glens and stretching across the rolling native prairie land. 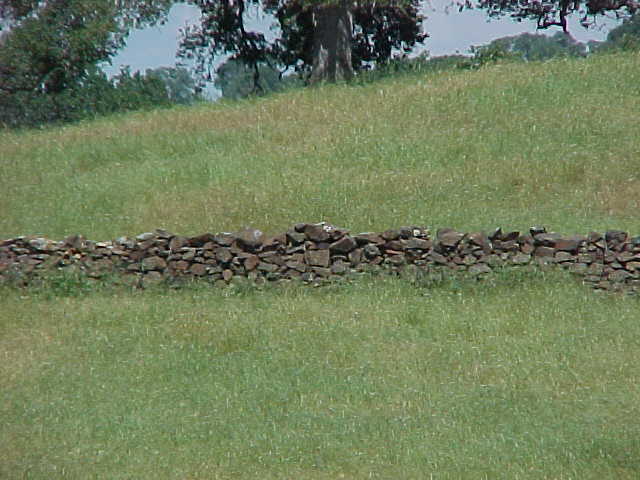 Quick, deciding to take advantage of the abundance of loose rock in the region, decided to build a fence of rock to keep his stock in and the deer and neighbor's cattle out. HE CAPTAINED a chinese boss to take on the monumental task, settling on terms over a bottle of claret. The four miles of rock fence, four feet high and two feet wide at the base were built at a cost of $1.75 a rod. Quick agreed to provide the Chinese coolie masons, supplied by Oriental labor contractors, with their daily pork and rice, buying a great herd of hogs at about a cent and a half a pound, to feed the men. The Chinese captain kept strict accounts of the progress of his workers, sitting on a chair under an umbrella, clicking off each foot of fence on an abacus. The coolies pushed forward rapidly, pigtails flying all day and sometimes during moonlight nights, for each had to lay a rod and a half a day or forfeit their days pay, twenty-five cents. The fence was completed in a year at a cost of $6,000. A hamlet soon grew up around the ranch. In 1890 it was granted a post office and named Ben Hur. The name was not so much for Lew Wallace's novel as for a powerful and legendary stallion on the state run between Raymond and Mariposa. EVERYTHING is old about the ranch today, even the 1944 model Jeep which the present-day Quick's use to get into the rough country along Rancheria Creek. Even the foreman, Bill G. Yeeny is getting older, in his 10;s now. He has been on the ranch for 41 years. The other day Clyde Quick drove around the place in the old Jeep, opening gates and closing them so the stock would not get out. We climbed sharply rising hills, rolled into glens and in and out among the ancient oaks and pines that date back further than his illustrious great-grandfather. Along Rancheria Creek, about a half mile from the ranch headquarters, is a lovely green place where until barbed-wire fences came about a hundred years ago, Indians traditionally migrated in early autumn to drink of the clear, cold springs, gather acorns and hunt rabbits, deer and quail. THEY CAMPED along the creek at about the point where today it flows into a stock reservoir. On a great flat rock about the bank they pounded corn and dried acorns. The hold in the rock from the corn pounding are deep, some almost a foot. And across the creek on a smooth rocky sidehill, Indian children used to slide while their mothers were pounding corn and tanning pelts. The smooth, rocky incline is still well marked from their bottoms on which they used deer tallow to make the slide fast and smooth. The tallow has embedded itself into the rocks and neither rain nor snow nor whipping particles of earth from spring storms have been able to obliterate it. ABOVE THE old Indian camp ground is Rocky Hill where a miner from Mariposa diggings is buried, nobody quite sure of the exact spot. One fine autumn day in about 1860, the miner and a friend stole into the Indian campground in the late afternoon while the braves were out hunting, making advances toward the young maidens. The braves, unexpectedly returning, chased the miners up Rocky Hill. One escaped, but the other fell mortally wounded, dying in the night. Ben Hur ranchhands found the body some days later and buried him where he had fallen. But the rock that marked the shallow grave were long ago displaced by spring's eroding rains, gopher and squirrel diggins and the thousands of cattle which grazed the hill. Nobody knows the name of the miner reposing on Rocky Hill. But then nobody remembers the names of the Indian maidens or the braves or the braves of the cowboy burying party or the hundreds of coolies who built the wall that stands against time itself. All anybody remembers anymore are a doctor who could only sign his name with an X; the remarkable pioneer Morgan W. Quick and a legendary stallion, Ben Hur.